Who knows where the R&B crooner is now, but I’m so glad that his hit single from 2004 has been revived ten years later by 21-year-old Brisbane singer WAFIA. Produced by Jack Vanzet (better known as Thrupence) and mixed and mastered by Andrei Eremin (Chet Faker, Oscar Key Sung), WAFIA‘s cover provides an ethereal vibe with a subtle electro-soul bounce. Very nice. My only disappointment is that I kind of wish WAFIA flipped the original and sang it from a female’s perspective, but her softer and sweeter version of ‘Let Me Love You’ makes up for it. 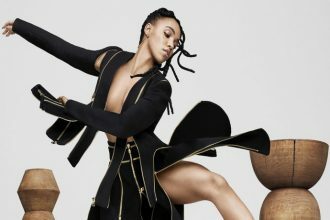 Back in July, FKA twigs hosted a free dance workshop in Baltimore alongside her team of choreographers and dancers. It was an open invite to anyone over 18, and select participants were invited to dance with twigs at her Baltimore show. The whole thing was filmed for a new documentary presented by WeTransfer.